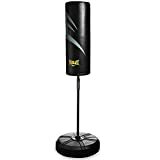 The Cardio Training Free Standing Bag from Everlast is a new entry level punching bag that’s ideal for light to moderate boxing cardio workouts. It’s predecessor used an inflatable bladder however this re-designed model has been given a solid foam bag for considerably more reliable and long lasting use. The height of the bag is fixed in one place to provide added support and durability, the Everflex flexible stem design is featured that accurately simulates the movements and rebounds of a hanging bag and also prevents the base from moving as it absorbs most of the impact too. A water or sand filled base will help to keep the bag fixed firmly to the ground weighing approximately 15kg when water filled and heavier with sand. Why Buy this Punch Bag?